There are copies of the UK pressing with no label on side 1, it is just blank, and with a complete white label on side 2. At least two of them have been sold on Ebay and both these copies had a stock copy sleeve and the picture inner sleeve. One of these had handwritten tracks in blue on the white label. Are those really test pressings? I don´t know but I call them test pressings until someone says different. It is of course possible that the sleeves are later additions or it might be that they are extra sleeves that were lying around at the time of pressing and someone thought the test pressings might as well be put in standard sleeves. The low price for the second copy on Ebay indicate that this record isn´t very unusual. Could it be that there were some kind of mistake with the labeling during one of the printing runs? In June 2011 New Zealand seller maidnhed sold a white label copy of NSTH together with a white label copy of the 12" version of Golden Years EP for $82. He described them as "BOTH WITH PLAIN WHITE LABELS(THOUGH A LITTLE DIRTY SHOWING AGE ), BOTH IN PLAIN WHITE SLEEVE, IN GOOD CONDITION WITH SOME SCRATCHES...I AM SELLING MY BROTHERS RECORD COLLECTION... A LOT OF THEM DON'T HAVE THE COVERS WITH THEM AND SOME OF THEM DO BUT I UNDERSTAND A LOT OF THEM MAY HAVE COME FROM UK OR EUROPE AS HE ACQUIRED A LOT OF HIS COLLECTION OVER THEIR, FROM HIS SEVERAL YEARS SPENT THEIR ON OE. 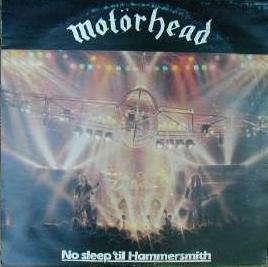 POSSIBLY UK AS HE ACQUIRED A FEW LPS FROM A WORK COLLEAGUE WHOSE FATHER WAS IN THE MUSIC INDUSTRY" In an email he also wrote about the white label Motorhead records that "they originally came from a record collection from an executive of a record label. He had passed them on to his son sometime in the mid 90’s, who from what my brother told me was a spoiled brat and didn’t look after them as they should have been, and hence the condition of some of these. My brother bought them off him when he was living with him in London late 90’s-2000. Now that he has passed they have been left to me which I am selling off for my nieces trust fund. I can honestly say that the labels look pretty good to me apart from being a little dirty/worn". Someone on Facebook at the time for the sale wrote about maidnhed that "the Iron Maiden signed drumhead he is selling is FAKE". In March 2014 London-based seller big_earz offered a test pressing copy for sale on Ebay with buy it now. This copy had white labels with a big 1 and 2 just like the test pressings for Iron Fist. Which makes sense since NSTH was a Polydor release just like the Iron Fist release. I had no sleeve, it was just housed in a die cut polylined sleeve with hand written title in the left corner. How much? GBP 250. And someone bought it!